In this article we are going to review RENPHO Bluetooth Smart Scale which is wonderful and quote impressive tool. 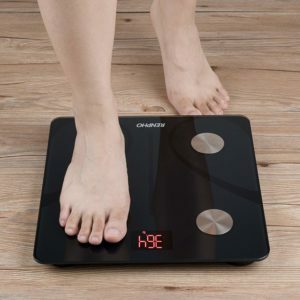 This Renpho Smart Scale allow you to measure whopping 13 metrics, which is more than any of the other smart scales. All these data at your feet, isn’t awesome ? It connects through bluetooth so you’ll need to turn on bluetooth to set up this scale. It can track unlimited users. It easily sync with Apple Health, Google Fit, FitBit App etc alongside with this it also allow you to share your data/progress with friends who use the app. 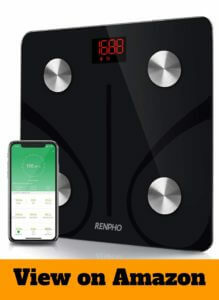 This RENPHO Bluetooth Body Fat Scale is great high quality product that comes with auto calibration, high precision sensors measure in increments of 0.2 lb. with 396 lb. capacity with 4 high sensitive electrodes. It scale on three AAA batteries which are included. It’s affordable and works better than various other expensive smart scales. Some user complained about inaccuracy but it happens rarely. Overall, A great, value for money, good built quality smart scale that’s why it earns 4.3 rating out of 5 in Amazon. (rated by 7000+ customers).